The black 2730WDK Wheeled Hard Case with Divider Kit from HPRC (High Pressure Resin Cases) is an ATA 300 rated case that is meant to hold your audio, video and photo gear in safety. This case contains a divider kit with which you can create customized pockets for your gear. The virtually unbreakable hard resin composition is supported on the inside by a neoprene O-ring that keeps it both air and waterproof. The addition of durable aluminum enhances the overall strength of the case. This combination of materials makes for a lighter case that translates into easier portage and lower shipping costs. The case is transported by built-in wheels and dual, soft grip, rigid handles. Its additional retractable tow handle works well with the wheels when you're navigating crowded areas such as airports, ramps and parking lots. Special attention has been given to the padded handles since this is a point of constant stress on the case. The handles are designed to be comfortable as well as making the case easier to roll along. 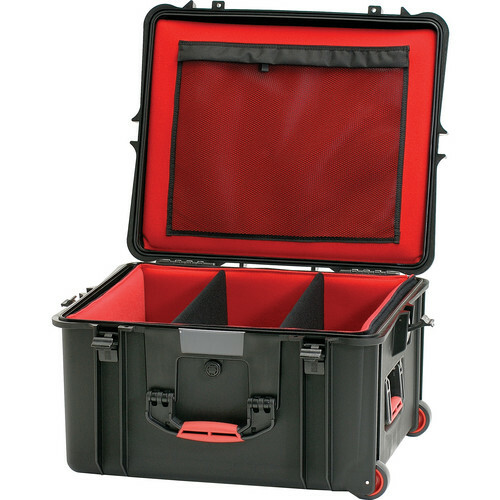 The case is opened on the long side for easy access to its contents and secured by a double-hinged latch system. The latches have been strategically placed along the base to make it harder for accidental opening. The built-in air pressure valve offers additional protection to the contents during long trips. Backed by its lifetime replacement warranty, the 2730WDK will provide you with a reliable and uniquely stylish way to transport your gear. Box Dimensions (LxWxH) 24.5 x 21.0 x 14.0"